The Hillsdale College Chargers are G-MAC cham­pions. On Sat­urday, the Chargers defeated the pre­vi­ously unde­feated Tiffin Uni­versity Dragons 48 – 26 to improve to 9 – 1 this season and finish the year a perfect 8 – 0 against G-MAC oppo­nents. The victory moved Hillsdale up to No. 20 in the NCAA Division II rankings and No. 5 in the regional rankings. Senior wide receiver Trey Brock, who already broke Hillsdale’s all-time records in recep­tions, receiving yards, and receiving touch­downs this season, caught a single-game career-high four touch­downs in the win. The con­ference cham­pi­onship is Hillsdale’s first since 2011, when the team won the GLIAC with an 8 – 3 record. 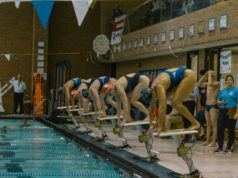 The 2011 team’s final victory of its con­ference schedule also came against Tiffin. The Chargers have one more game remaining on their regular season schedule, and it comes against a non-con­ference rival, No. 12 Uni­versity of Indi­anapolis, on the road this Sat­urday. In the most con­se­quential game at Frank “Muddy” Waters Stadium in years, Tiffin moved the ball 96 yards for a touchdown on its first pos­session of the game to take an early 6 – 0 lead. The Chargers responded on their first pos­session of the game with a touchdown, thanks in part to a third-down pass inter­ference penalty against Tiffin that kept the drive alive. On the seventh play of the drive, senior quar­terback Chance Stewart found Brock in the end zone for a 25-yard touchdown and Hillsdale took a 7 – 6 lead with the extra point. The score marked Brock’s fourth con­sec­utive game with a touchdown reception, but he and Stewart were only getting started. Tiffin retook the lead on its next pos­session with a field goal, but junior running back David Graham’s 14-yard touchdown run put the Chargers ahead 14 – 9. Twice on the scoring drive, Hillsdale gained first downs on third-down attempts thanks to penalties against Tiffin. The Dragons were penalized eight times in the game, while the Chargers com­mitted only one penalty. Hillsdale is the least penalized team in all of NCAA Division II. Sophomore kicker Joe Philipp added a field goal on Hillsdale’s third drive to extend the lead to 17 – 9, and it appeared that the Chargers would head to the locker room at halftime with the lead. In the final 99 seconds of the second quarter, however, the Dragons turned the tables. A field goal cut Hillsdale’s lead to 17 – 12, and after the Chargers’ offense went three-and-out, Tiffin moved the ball 55 yards in less than a minute to score a touchdown and take a 19 – 17 lead at the half. The Chargers got the ball to begin the third quarter, and two com­ple­tions to Brock, one for 59 yards and the second for a 13-yard touchdown, was enough for Hillsdale to quickly regain the lead. This time, the Chargers wouldn’t relin­quish it. On Tiffin’s next pos­session, freshman defensive lineman Kyle Parran got to the quar­terback for a sack and forced a fumble to getthe ball back to the Chargers’ offense. Parran col­lected three sacks and four tackles for loss on the day in the best game of his career. The per­for­mance earned him the G-MAC Defensive Player of the Week award. Philipp’s second field goal of the game extended Hillsdale’s lead to eight points. Philipp went 2-for-2 on field goals and 6-for-6 on extra points, earning him his second G-MAC Special Teams Player of the Week award this season. Hillsdale’s defense forced another turnover on the Dragons’ next pos­session. This time it was senior defensive back Carter Wilson who forced a fumble after a com­pletion. Wilson also played arguably the best game of his career, and his per­for­mance was even more impressive when con­sid­ering he was removed from the game during the first half because of an injury that pre­vented him from walking off the field under his own power. Stewart con­nected with Brock for a third time, a four-yard score, to build a two-touchdown lead. Although Tiffin cut the deficit back to one touchdown at the beginning of the fourth quarter, Brock’s fourth touchdown reception on an acro­batic catch in the back of the end zone and a one-yard quar­terback sneak by Stewart for a touchdown put the game out of reach. Stewart’s five total touch­downs were a single-game season-high. For Brock, the showcase was just the latest in a remarkable career at Hillsdale. Already at the top of the Hillsdale record books, this per­for­mance came in his first oppor­tunity to be on a team that’s on top of the con­ference. Brock fin­ished the game with 10 recep­tions for 156 yards. His 13 touchdown recep­tions this season are tied for fourth-most in all of NCAA Division II. Senior line­backer Jay Rose inter­cepted a pass in the end zone in the game’s closing minute for the Chargers’ third forced turnover of the game. 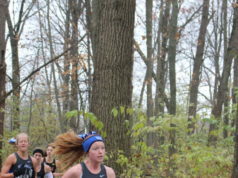 Perhaps lost in the excitement of the winner coming away with the G-MAC cham­pi­onship was the fact that the team also cel­e­brated Senior Day in its final home game of the regular season. The seniors delivered, with Stewart and Brock pacing the offense and Wilson and Rose leading the way on defense. Winning a cham­pi­onship on Senior Day was a cul­mi­nation of not only a record season for the Chargers, but a multi-year process, according to Stewart. The Chargers’ defense allowed just 93 yards on the ground to Tiffin, one of the G-MAC’s best rushing offenses entering play. Hillsdale also col­lected four sacks, a single-game season-high. With the regular season G-MAC cham­pi­onship in the bag, the Chargers’ chances to make the NCAA Division II playoffs look better than ever. A win on Sat­urday against Indi­anapolis would ensure a spot in the tour­nament. 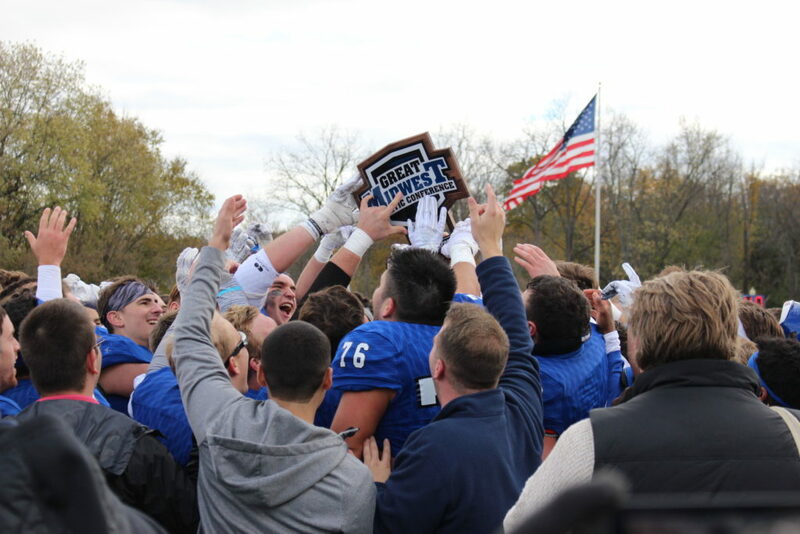 A loss would muddy the picture, but Hillsdale’s resume might be strong enough already to maintain a spot in the top seven of the Super Region I rankings. Otterbein isn’t worried about the details. He knows that a G-MAC cham­pi­onship is nice, but the first thing he said after Saturday’s win? 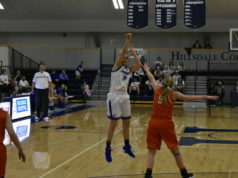 Indi­anapolis defeated Hillsdale last season, 45 – 38. Indy was ranked No. 14 at the time, while the Chargers were unranked. “We’re going to take this as the first round of the playoffs and get pre­pared that way and hope­fully our guys will put in the same kind of time and effort that they did this week,” Otterbein said. In last year’s loss to Indy, Stewart threw for 485 yards, a school record for passing yards in a single game. Coach Otterbein was big to admit to his error, as it turned out it didn’t matter. But at that time in the game it seemed a very BIG mistake. Even so, I’m really proud of the this years team. I didn’t expect they would be so strong, I was thinking this was more of a rebuilding year. But with Chance, Trey and Austin not coming back next season they com­mitted to doing what was nec­essary to win the con­ference. Out­standing season, great per­for­mances-well done Coaches and Players! At least 2 more games to go in this season. I’m really curious which QB will seal the starting job for next season, it’ll be an epic contest in Spring ball.